I did it! I stamped...and colored...and even heat embossed. SHOCKING, I know! I'm hoping to get back into the swing of things after way too long away from crafting. I started with a little ATC swap using products from The Cats Pajamas - The Mustache Set and coordinating die and the Step Right Up set. Can't wait to see what the other girls have created too! Fun fun! I somehow managed to squeak out two sets of ATCs between last night and today. 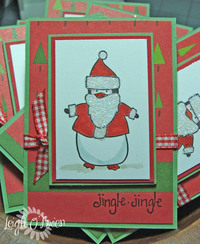 I had a whole list of stamping projects to finish this week before I could cross everything off of my "to do" list. So glad to be done with it all. 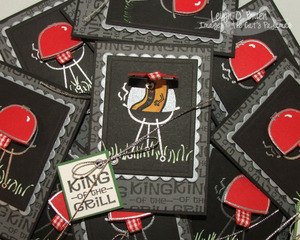 Supplies: (F-7451) Smokin’ Barbecue, (G-7455) Dancing Food, and (C-7449) King of the Grill - all from The Cat's Pajamas; CS - Basic Gray, Basic Black, Silver, Real Red, Wild Wasabi, and Shimmery White from SU! ; Ink - Palette Noir, Versamark; Other - Nestabilities die, Silver EP, SU! Silver cord, MM silver eyelets, green Souffle pen, green Spica glitter pen, various Copics, SU! gingham ribbon. And this one shows off some newer A Muse stamps that I just had to have. I really like the simplicity of this one and this is some of my fave patterned paper right now - Dill Blossom by SEI. 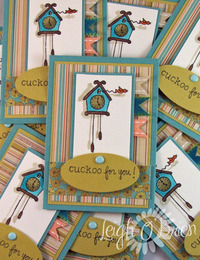 Supplies: Stamps - Cuckoo Clock (2-7147D) and Cuckoo for you (8-8466B) from A Muse Artstamps; CS - textured CS from DCWV, chartreuse CS - unknown, watercolor paper; Dill Blossom designer paper from SEI; Ink - Palette Noir and various SU! inks for watercoloring; Other - DCWV brad, SU! River Rock and Groovy Guava ribbon, turquoise ribbon from Michael's, SU! oval punch, waterbrush. 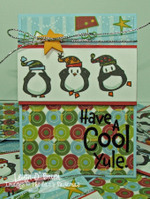 Supplies: Stamps - See No Evil (F-7495) and Cool Yule (D-7478) - these can also be found in the Kitty Christmas and Polar Holiday Clearly Swanky sets by The Cat's Pajamas; CS - Bashful Blue, Ruby Red, White from SU! ; Ink - Black Versafine, Bordering Blue, Versamark; Other - MM star button, silver cord, Black Detail EP, SU! 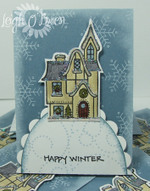 Markers, patterned papers by Scrapworks - Season of Joy collection. 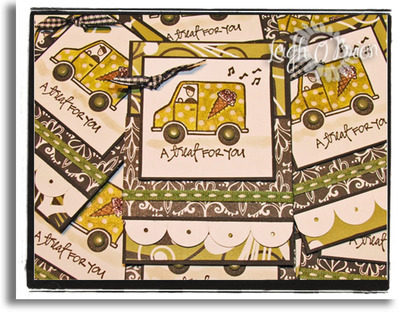 Supplies: Stamps - Max Wheels (C201) by Stampendous and Bright Holidays (9-8206C) by A Muse; CS - Kraft, White by SU! ; Ink - Black Versafine, Versamark; Other - wire, red Martha Stewart Seam Binding, Stardust Glitter Pen, Liquid Applique, Twinkling H2Os, Black Detail EP, waterbrush, Nestabilities Scalloped Circle Die, Creative Memories Circle Template, sponge, patterned paper by Basic Grey - Fruitcake Collection. Supplies: North Pole (7-7138F), Happy Winter (9-8277B), and Snowflake sm (3-2021B) by A Muse; CS - Buckaroo Blue, White by SU; Ink - Black Versafine, White Craft, River Rock; Other - Dazzling Diamonds, Glue Pen, Waterbrush, SU! Markers, sponge, waterbrush, Nestabilities Scalloped Oval Die, Creative Memories Oval Template, patterned paper by Scrapworks - Season of Joy (dotted swirls). 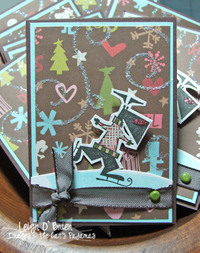 I finished up a couple of ATCs today for a swap with the Dirty Dozen gang over at Splitcoast. I love swapping with them since you can guarantee that the swaps will be awesome. 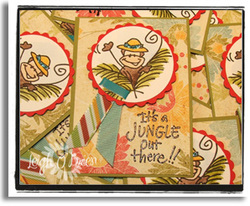 Jen Del Muro has been organizing these quarterly, I think, ATC swaps for a while and she always does a great job in collecting them up and getting them back out. Supplies for Changito: Stamps - Changito and sentiment by Stampendous (purchased from Anna Wights e-Bay store); CS - Old Olive, Real Red, Bo Bunny scrapbook paper; Ink - Black Versafine, Versamark, various for watercoloring; Other - scalloped edge scissors, circle punch, detail Black EP, ribbon, waterbrush, turquoise Stickles, Fastenator and big ole staples....remember that thing?! I signed up at the last minute for Taylor Van Bruggen's A Muse ATC swap. I love A Muse and I love ATCs because they don't take forever to do and they're small and don't take up a ton of room. 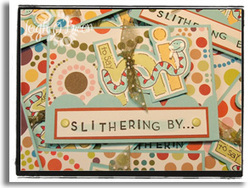 Now, Taylor's been previewing all of her ATCs over on her blog and they are all TEEEEEE-RIFIC! I would love to have one of each of them but since I'm only in one group I'll have to settle for Taylor's card plus the other eight stampers in my group...can't wait to get 'em in my hot little hands...*snicker snicker*...I'm sure that they'll all be fabulous. I bought this cool green/black/white scrapbooking paper last week at my LSS. It's by American Crafts. They've really stepped up their papers this year. I love the bold colors and clean lines. I think this stuff reminds me of Mondrian and I've always loved his work. These particular papers are in the A La Carte collection and are called Pesto (Olive) and Balsamic (Black). Just going to their site to get you the link made me drool! Supplies: Stamps - All by A Muse Artstamps; CS - Basic Black, Whisper White, scrapbook papers from American Crafts; Ink - Black Versafine, Sahara Sand for shading, Blush Blossom for face; Other - waterbrush, Twinkling H2Os, brads, ribbon, Pink Stickles, Pink Souffle pen for polka dots, 1/16 hole punch, SU! slit punch for scalloped edges, SU! Horizontal slot punch.